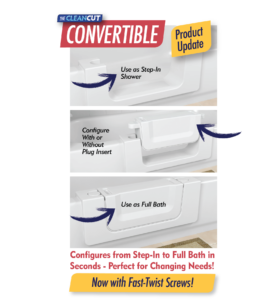 The Convertible is our fastest growing and most versatile product, and is now even better with new fast-twist brass screws! These screws are used to lock and unlock the plug, allowing you to effortlessly transform your CleanCut product from step-in shower to full bath. The new screws require only a few twists to lock securely in place. Order yours today and see how easy!